Summertime’s here and unfortunately a lot of fall shows didn’t make the cut. There are a lot of web sites you can look at to find out if your favorite show has been canceled. Personally I like this one from Variety. (It’s a month or so old, so it doesn’t include Roseanne.) No matter where you look though, you’ll realize that you’re probably set up to record shows that aren’t coming back. Luckily there’s an easy way to deal with that. 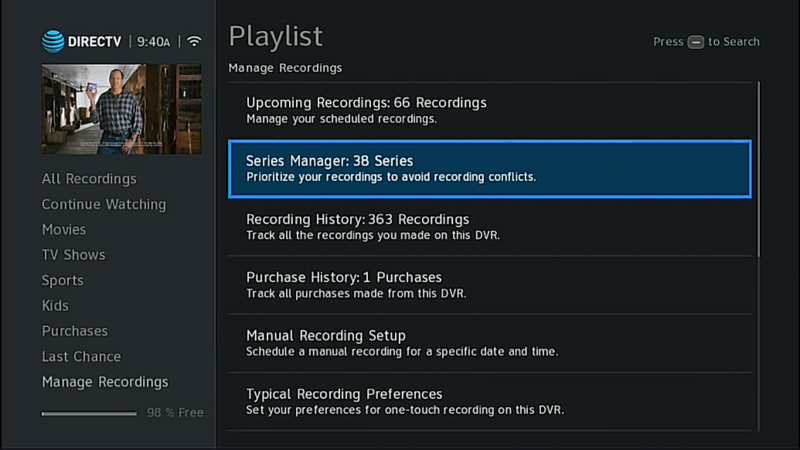 Your DIRECTV DVR can record 100 series. That’s a pretty high number but not infinite. That 100-series-link limit has been around since the days of the HR34 in 2011. Before that it was lower — only 50 series. Back then keeping an eye on your recordings was pretty important. You would think that if AT&T wanted to do so, they could increase that number or make it unlimited. In fact, TiVos had unlimited series links almost 20 years ago. But whatever…100’s still a pretty high number. Still, if you don’t pay attention you’ll eventually use up all 100 spaces and then you won’t be able to record any more series. You’ll end up frantically cleaning things out in a hurry. It’s better to just do the cleanup as you go. There’s another benefit: If your DVR is doing all the math to find all those canceled shows, it’s working harder. This could mean it slows down while you’re trying to do other things. In the past, keeping that series manager clean was the easiest way to make sure that you had a nice speedy experience. I’m not sure that’s still true but it’s still worth doing. Finally, if you know a show has been canceled, you should clean out its recordings so you don’t potentially record a lot of reruns. Some channels aren’t real great about guide data and sometimes you’ll end up seeing a lot of reruns in your list. Again, you’re stuck cleaning them out. Press the LIST button on your remote. You’ll see the screen above. Arrow over to “Series Manager and press SELECT. You’ll see a list of all the series you have set up to record. Press the (R) button (not the red button) to delete a series link. 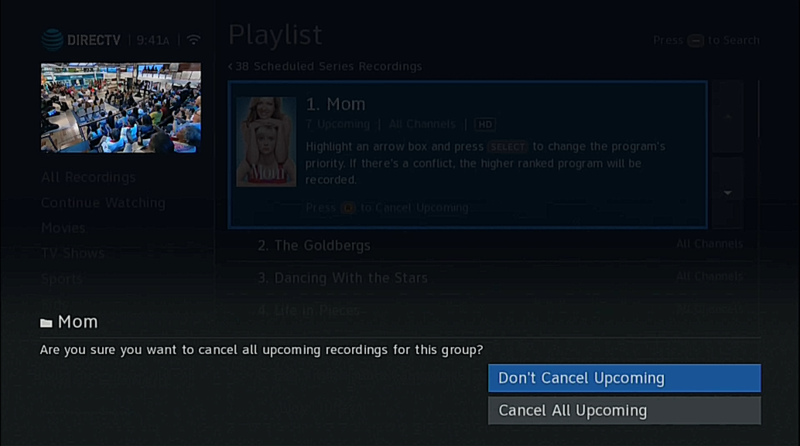 You’ll have one more “Are you sure” where you have to arrow down and press SELECT to cancel all the upcoming episodes. This sounds like a lot of work but it really isn’t and it goes by pretty quickly. You can arrow up and down to go to different series and delete them pretty quickly if you want. This is perfect for getting rid of those limited series that aren’t coming back, or those shows you’ve just given up on. It’s also good for any show that you completely forgot that you started watching because it fell off the schedule a year ago. Yes, that’s happened to me. There’s an old book that called this sort of periodic maintenance “sharpening the saw.” It’s a good idea to spend a little time every so often just making sure everything is set the way you want, and then you won’t run into trouble later.